DK Row, The Oregonian: "In Hiebert’s hands, paper becomes an alternately muscular and fragile material capable of enigma, mystery and beauty. She crafts small-scale works that suggest the influence of architecture and the landscape: radial patterns, hexagonal shapes, various undulating forms that resemble the waves of sand found in the endless desert." Red Cliff, Colorado: Helen Hiebert Studio, 2019. Edition of 25. 12 3/8 x 9 1/2"; 54 pages plus cover. Stitched into a single signature. Deckled edges. 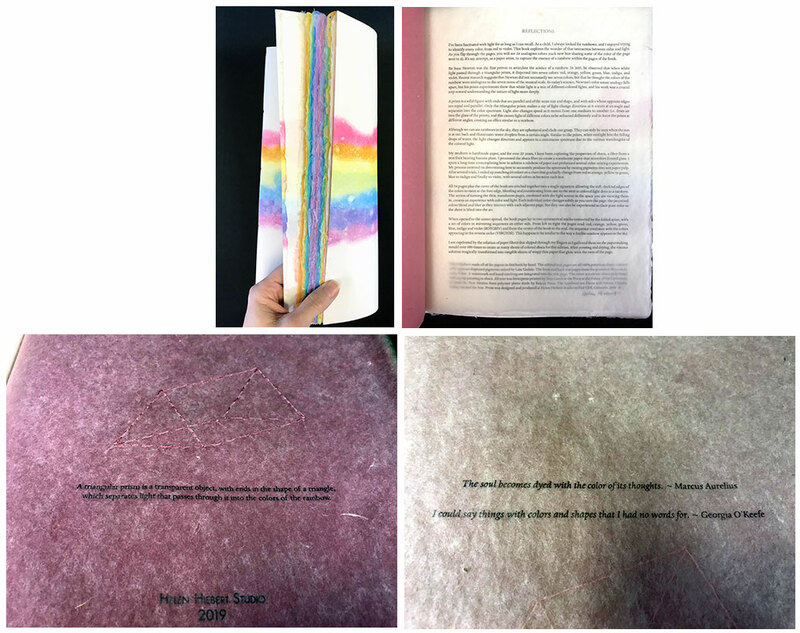 Text pages on 100% premium abaca, colored with aqueous dispersed pigments mixed by Lata Gedala. Front and back text pages in premium abaca natural hue. Title page includes watermark and hand stitching. Cover of cotton/abaca pulp blend with a pulp painting in abaca. Text letterpress printed by Tom Leech at the Press at the Palace of the Governors in Santa Fe, New Mexico, from polymer plates. Printed in Dane and Futura typefaces. In a clamshell box created by Claudia Cohen. All handmade papers by Helen Hiebert. "A prism is a solid figure with ends that are parallel and of the same size and shape, and with sides whose opposite edges are equal and parallel. Only the triangular prism makes a ray of light change direction as it enters at an angle and separates into the color spectrum. Light also changes speed as it moves from one medium to another (i.e. from air into the glass of the prism), and this causes light of different colors to be refracted differently and to leave the prism at different angles, creating an effect similar to a rainbow. "My medium is handmade paper, and for over 25 years, I have been exploring the properties of abaca, a fiber from a non-fruit bearing banana plant. I processed the abaca fiber to create a translucent paper that resembles frosted glass. I spent a long time contemplating how to achieve a rainbow of paper and performed several color-mixing experiments. "All 54 pages plus the cover of this book are stitched together into a single signature allowing the soft, deckled edges of the colors to meet at the fore-edge, blending and transitioning from one to the next as colored light does in a rainbow. The action of turning the thin, translucent pages, combined with the light source in the space you are viewing them in, creates an experience with color and light. Each individual color changes subtly as you turn the page: the perceived colors blend and blur as they interact with each adjacent page, but they can also be experienced as their pure color as the sheet is lifted into the air. "When opened to the center spread, the book pages lay in two symmetrical stacks connected by the folded spine, with a set of colors in mirroring sequences on either side. 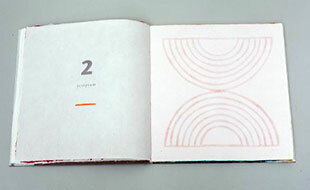 From left to right the pages read: red, orange, yellow, green, blue, indigo and violet (ROYGBIV) and from the center of the book to the end, the sequence continues with the colors appearing in the reverse order (VIBGYOR). This happens to be similar to the way a double rainbow appears in the sky." Red Cliff, Colorado: Helen Hiebert Studio, 2017. Edition of 30. 12 x 9"; 14 leaves. Paper handmade by the artist of 100% cotton rag fiber. Pulp stenciling technique used on the cover and end sheets. Text printed by Tom Leech at the Press at the Palace of the Governors in Santa Fe, New Mexico, from polymer plates. Dante typeface. Handcut and scored geometric shapes. Hand stitched. Bound by Claudia Cohen. Laid in 12.5 x 9.5" black cloth covered box by Claudia Cohen. Designed by Helen Hiebert. Helen Hiebert: "After viewing (and handling) the 1570 edition of Euclid’s Elements of Geometry at the Denver Public Library, I was drawn to Chapter 11, which focuses on polyhedra. I find it interesting to imagine how Euclid constructed his ideas in the physical world, since paper was invented later. Perhaps he constructed them in papyrus or parchment (precursors to paper). I am intrigued by the many ways in which a flat sheet of paper can transform from two- into three-dimensions. I was drawn to the tiny flaps glued into the pages of the old copy of Euclid’s Elements, which allow the reader to explore the physical relationships between lines, angles, and surfaces. "I built the basic polyhedra, or platonic solids, into the pages of the book (which are double-sided cotton handmade sheets). Each form lies flat on the page (like an architectural floor plan) with visible cut and score lines. The shapes can be lifted from the page (but not removed) and folded to create each polyhedra. The text is adapted from Euclid’s Elements (which was originally translated into Old English) and is direct, simple, and didactic. "The basic text is letterpress printed, and I hand stitched the name and a flat rendering of each three-dimensional shape (tetrahedraon, cube, octahedron, dodecahedron, icosahedron). I enjoy repetitive handwork and the interaction with the sheets as I stitch. I spend about an hour with each page, turning it back and forth as I insert the needle time and again. "Each folio is double-sided. The color sequence (most visible on the spine) flows through the ten chromatic color fields, appearing sequentially. The geometric shapes begin flat and white, but when folded into their solid forms, they appear as colored shapes. As the pages turn, the shapes become more complex, beginning with four triangles that fold up into a tetrahedron and ending with a 20-sided icosahedron. 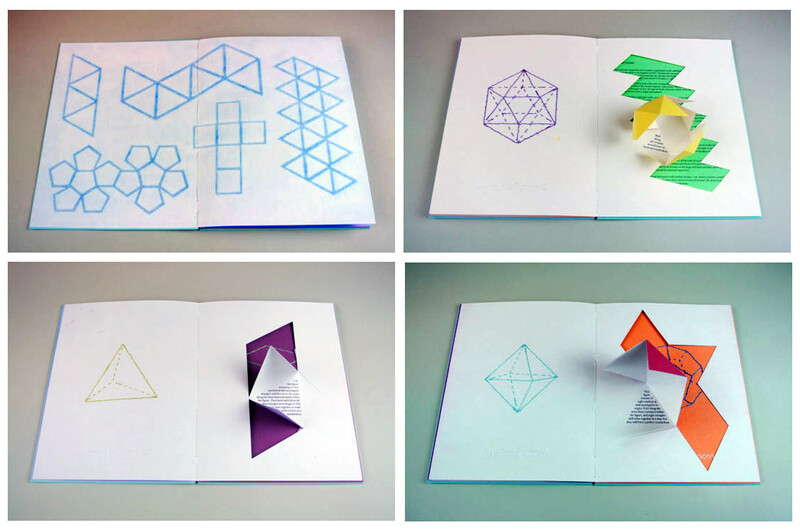 The shapes in this book are meant to be formed on the page and then unfolded, allowing a mental image of each polyhedra to live in the mind beyond the physical experience." [Red Cliff, Colorado]: Helen Hiebert Studio, 2016. Edition of 40. Box size: 6.5 x 5.25 x .5". Book: 6 x 4.5" closed, extends to 24"; 8 panels. Double-sided accordion fold. Paper lift in box with colophon tipped in. Signed by both artists and numbered on the colophon. 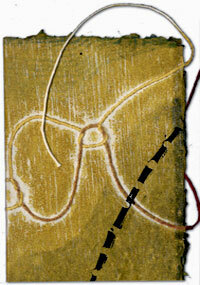 A collaboration between Helen Hiebert, papermaker, and Karen Kunc, printmaker. Helen Hiebert: "LandEscape began with drawings twisted (literally) in string that established a collaborative landscape realized over two years of conversation and trust. Helen Hiebert created watermarked illustrations in an artist-made cotton/abaca paper, and Karen Kunc responded by producing a woodcut image that interacts with the watermarks, fitting into spaces, overlapping, making edges, and saturating them with color. Paper and print are meant to intrigue with shadows and illusions." Red Cliff, Colorado: Helen Hiebert Studio, 2015. Edition of 35. 10 x 6 x 2" box containing Mini Mother Tree components and Mapping Motherhood print. Mini Mother Tree: two tree interlocking stand pieces, dress of handmade abaca leather paper with embedded string, two crocheted strands with stones at each end. Mapping Motherhood print: archival digital print on hand-stained Tyvek®, which folds into a house shape with double-couched stenciled handmade paper covers. Box container: laser cut stained plywood fabricated by Platypus Papers. Helen Hiebert: "I turned fifty in May of 2015. Leading up to this I started thinking about a work of art to capture the milestone. I turned to a work from about five years earlier that I created. Mother Tree, a large sculptural dress that turns into a tree, as pure white crocheted threads representing mother’s milk cascade from the chest and turn into multi-colored roots as they hit the floor. These roots were crocheted and contributed by a community of five hundred. 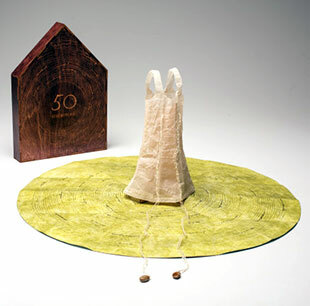 "50 Revolutions represents the fifty revolutions I’ve taken around the sun and my evolving thoughts on motherhood. Both projects stem from the bouts of isolation and inadequacy I feel as a mother, so again I reached out to my community seeking fifty words about mother/motherhood and realized how similar the journey is for all of us. 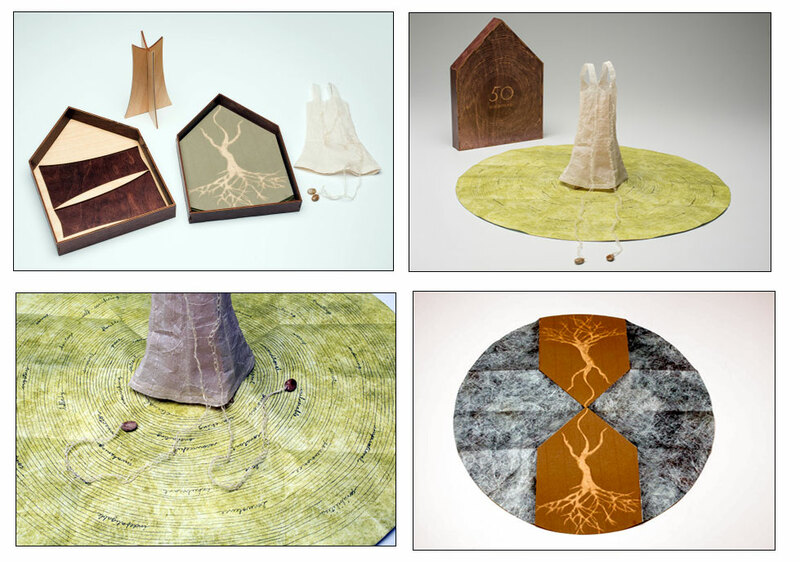 The book includes a Mapping Motherhood print and a miniature Mother Tree. Each of the fifty rings in the print, like the rings in a tree, contains one of the words, hand written. These words are the topography of motherhood: survival, mystery, constant, awakening, home…. A miniature Mother Tree sits in the middle of the print with two single strands of crocheted mother’s milk representing this thread that has flowed through mothers since the beginning of time." Red Cliff, Colorado: Helen Hiebert Studio, 2015. Edition of 25. 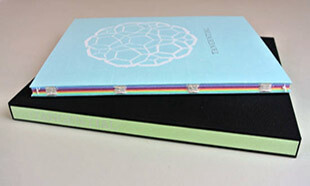 9 3/16 x 9 3/16"; 72 pages including colophon and endsheets. Handmade papers by Helen Hiebert. Illustrated with 7 hand-cut paper illustrations. Printed letterpress in Dante by Tom Leech, Palace of the Governors Press, Santa Fe, New Mexico from polymer plates made by Boxcar Press. Bound by Claudia Cohen with hand-sewn exposed spine and grey paper wrappers printed with title and geometric shapes in darker grey on front panel. Housed in custom-made box of plum silk over boards with title printed blind on grey paper laid onto spine. Signed by the designer / papermaker, Helen Hiebert and dated on the title page. Propectus: "Illustrated with 7 hand-cut paper illustrations (translucent abaca paper in hues of rainbow) portray the mysteries of life: a baby in the womb, a couple, a child, a child gaining strength and running to embrace life, the building of a home (the pentagonal shape), exploring the world and, finally, spiritual contemplation. The seven white handmade papers feature seven intricate geometric watermarks which relate to the numbers one through seven and their corresponding shapes: point, line, triangle, square, pentagon, hexagon, septagon. While the numbers 1-7 have many meanings - days of the week, notes in musical scale, colors of rainbow - the 7 geometric shapes here progress from a point (the circle) to a seven-sided form. If this sequence were to continue ad infinitum, the resulting multi-sided figure with an infinite number of sides would approach the shape of a circle again (either the beginning or the end). "Helen Hiebert, has contributed a page of 'Reflections' which is an artist's statement in which she discusses this book. 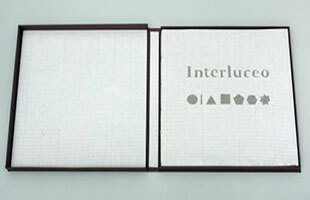 Interluceo is defined as to shine or gleam between, to be transparent, to light or light through gaps. The luminosity of abaca (banana plant fiber) is cited as an inspiration to create the colored papers of INTERLUCEO. Ms. Hiebert discusses watermarks - noting that hers are created not from wire in the papermaking mould but rather a thin rubber material. They are beautiful and the perfect subtle foil to the obvious brilliance of the cut-outs. … Looking at the edges of the book reveals the rainbow inside and urges the reader / viewer to enter into the mystery of light and color. 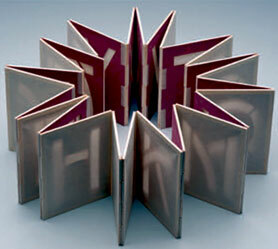 ..."
Helen Hiebert, Colophon: "This book derives from my eternal interest in geometry and light. The watermarking technique gave me the method for melding these fascinations, and the book form provides the structure for expanding on these ideas. 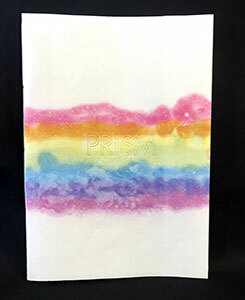 I made a seventy-five percent cotton / twenty-five percent abaca blend paper to showcase the watermarks and pigmented the abaca pulp to create the rainbow spectrum of translucent papers. The illustrations by Beatrice Coron allow for the introduction of light, shadow, and mirror images." Edwards, Colorado: Helen Hiebert Studio, 2013. Edition of 50. 7 x 7 x 7" laser cut wood box containing inflated paper globe. Pigmented and air-dried handmade abaca paper with embroidered text. Colophon ink-jet printed on handmade papers. Signed and numbered by the artist. 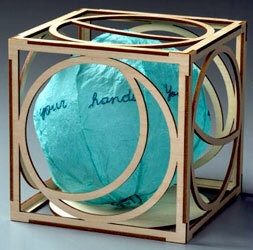 Helen Hiebert: "Handle With Care is a small paper globe, created from eight gores (sections) of handmade abaca paper that are glued together and then inflated. Hand-embroidered text runs along the equator and reads You are Holding the World in Your Hands. The globe rests in a laser cut box, and its sides have cutouts of the phases of the moon." Portland, Oregon: Helen Hiebert Studio, 2012. Edition of 50. 4.75 x 6"; 4 pages. Pamphlet fold. 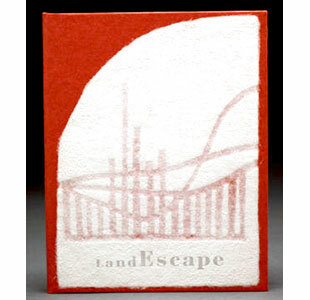 Letterpress printed on handmade paper of 100% cotton, featuring a pigmented pulp lamination. Laser cuts. Housed in a handmade paper wrapper with a circular die-cut window. Helen Hiebert, blog: "This project began twenty years ago, when I took a trip to Japan and was inspired by the way light filtered through traditional shoji screens in the Ryokan (Japanese Inn) where I stayed. 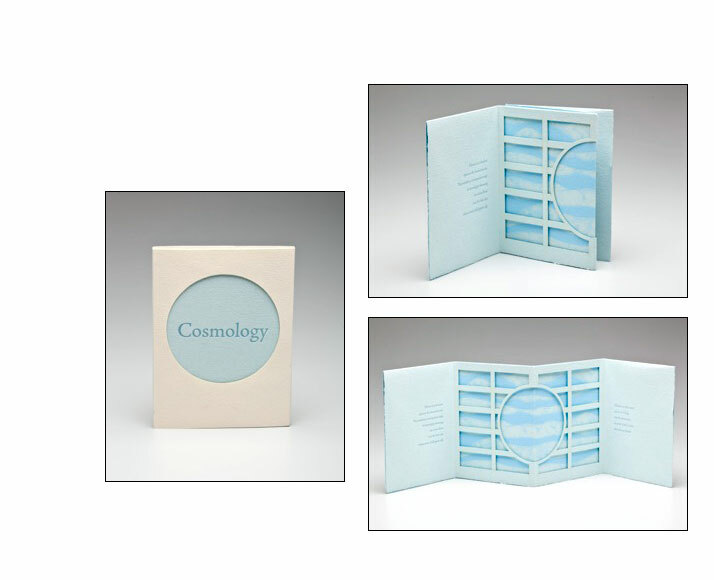 Cosmology features a laser-cut shoji window, and I used a one-sheet book structure to create a space in the middle of the book. During the papermaking process, I created the imagery using a watermarking technique. I adhered a thin adhesive-backed rubber to the mould and pulled a very thin sheet, so that the pulp slipped off of the rubber, leaving only a thin whispery vail. Next, I couched the blue image onto an off-white base sheet." 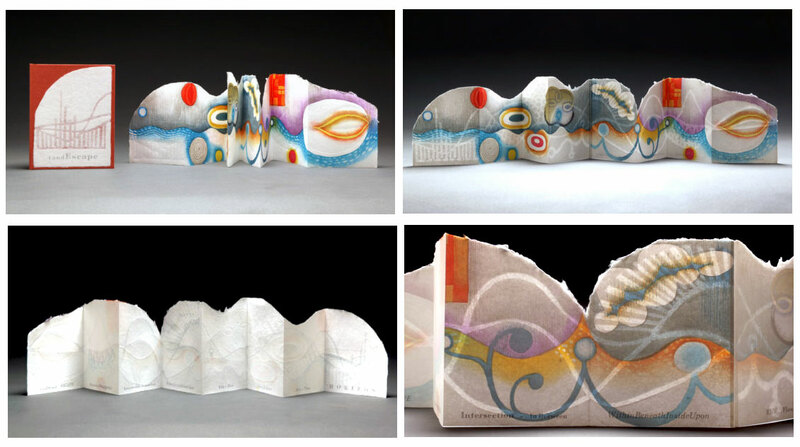 Helen Hiebert, artist statement: "This one sheet book structure has always intrigued me, and I have a particular love of Japanese shoji screens. The shoji pattern creates a window and the book structure creates a room or space. I wanted words to tie it all together, so I commissioned Carl Adamshick to write the poem." Avon, Colorado: Helen Hiebert Studio, 2012. Edition of 50. 6.75 x 7.375" closed, extends to 6.175 x 18 x 8"; 4 pages. Letterpress printed and laser-cut paper pages. 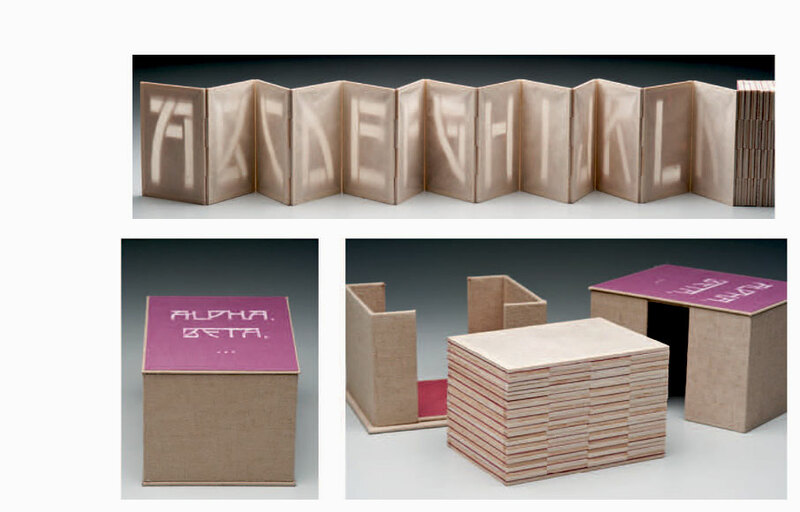 Book board, book cloth, cherry-and-plywood laser-cut box. Hand-drawn graphite images. 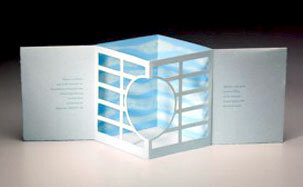 Gate fold with fold-out pop-up panels. Housed in a cherry and plywood box with cut-outs of each animal featured in the book. Includes a mini-flashlight. Signed and numbered by the poet and artist. Colophon card laid in. Signed and number by artist and poet. 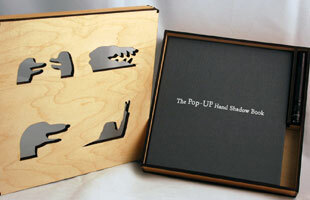 Helen Hiebert: "The Pop-Up Hand Shadow Book features four illustrated animal hand shadows in a theatrical book structure. 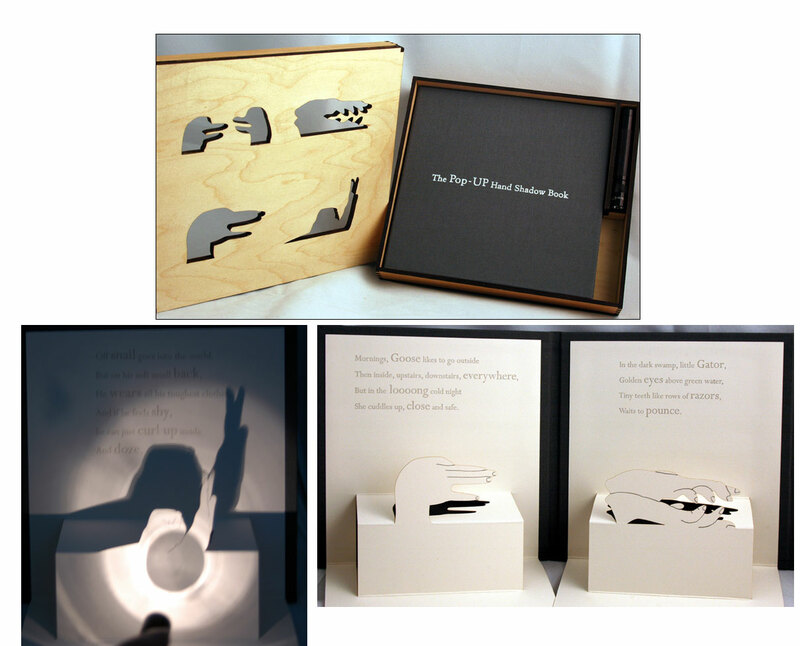 The animals are brought to life as the viewer plays with a mini flashlight (packaged with the book), casting shadows onto panels behind the pop-ups in the book. A verse about each animal, by the poet appears on each page." Portland, Oregon: Helen Hiebert Studio, 2010. Edition of 25. 5.9 x 4.5" closed, extends to 117"; 26 pages. Accordion structure with flexible hinge. Handmade paper on balsa wood framed panels. Cut out letterforms. Colophon letterpress printed by Diane Jacobs. Housed in windowed paper-covered box (6.75 x 5.25 x 4.5"). Helen Hiebert: "A book in the form of a unique lantern structure with a flexible hinge that allows it to be set up in a variety of ways. 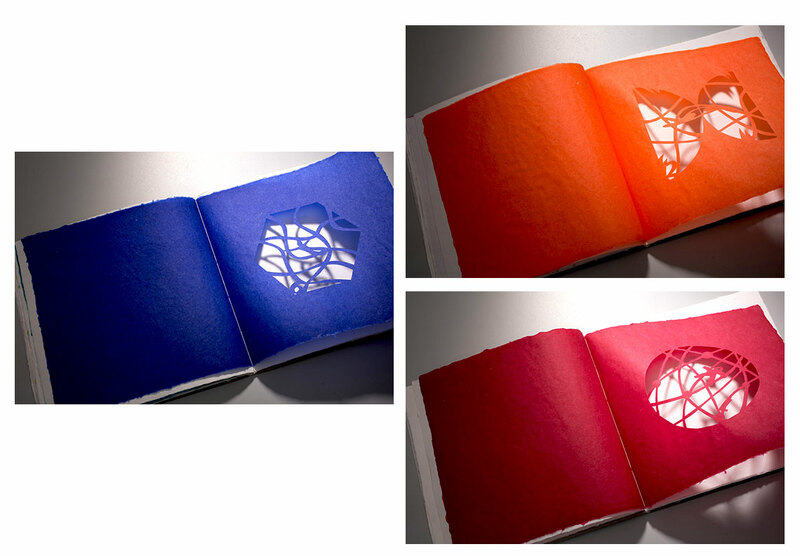 Each panel of the shadow lantern features an alphabet letter cutout that casts a shadow onto a second layer of paper. The letters are in the Arts and Crafts style font designed by Dard Hunter, often referred to as the father of hand papermaking in 20th century America. Composed of lightweight wood and paper panels in an accordion book structure, with a flexible hinge that allows it to be set up in a variety of ways. Each shadow lantern is stored in an architectural handcrafted box designed and produced by Claudia Cohen." 4 x 5.875" closed, opens to 10.75 x 14.5"; one sheet relief print folded three times. Paper handmade by Hiebert from 100% hemp half-stuff supplied by Twinrocker. Housed in a dark blue paper envelope. Andrea Peterson, a paper artist and printmaker living in Indiana, created the relief print, which interacts with two lengths of different colored string embedded in the paper. The two lengths of string circle and intersect, reflecting ideas of journey and relationships that come together by circumstance. 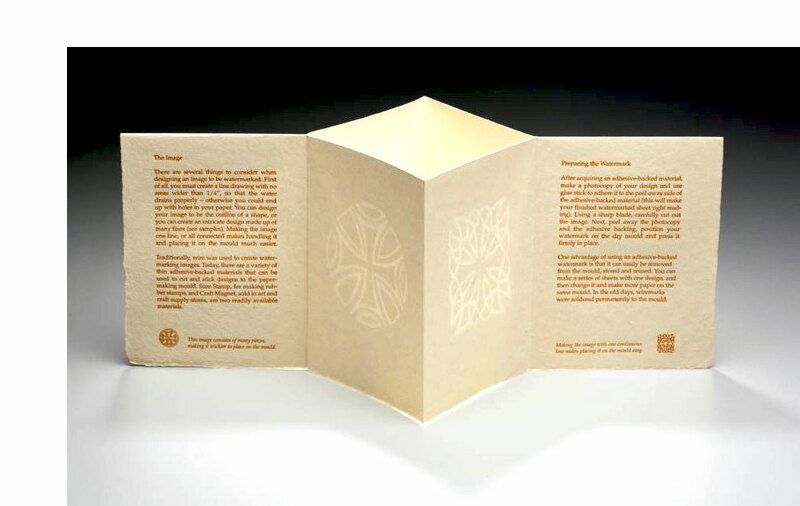 Colophon: "This is a collaborative peace created by two friends whose paths have crossed many times over the past 15 years as they've shared experiences as paper artists, women, wives, and mothers." Portland, Oregon: Helen Hiebert Studio, 2005. Edition of 100. 4.75 x 6.25"; 6 pages. 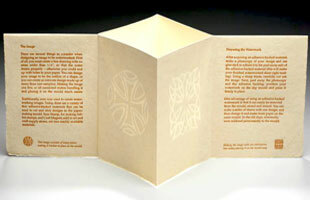 Single sheet book made from cotton paper made on a Tim Moore laid mould with watermarks hand-cut using Sure Stamp. Letterpress printed by Diane Jacobs. Unfolds to display four large watermarks. Held in a transparent paper slip with colophon printed in black. Helen Hiebert Studio: "This is the first in a series of instructional pamphlets on modern day watermarking. Look for upcoming editions on fabric paint watermarks, wiremarks, and computer generated watermarks." Introduction: "In this pamphlet, you will learn how to create your own watermarks – those mysterious images hidden within sheets of paper, often invisible until lifted to the light. With this low-tech method and simple materials, you can create unique images in your handmade papers while using an age-old papermaking technique." Portland, Oregon: Helen Hiebert Studio, 2010. Open Edition. 5 paper letterforms in 2 x 8.5 x 2" cherry wood box with sliding glass lid. Handmade paper. Graphic design by Shu-Ju Wang. Colophon printed by Diane Jacobs. Signed and numbered by Hiebert. 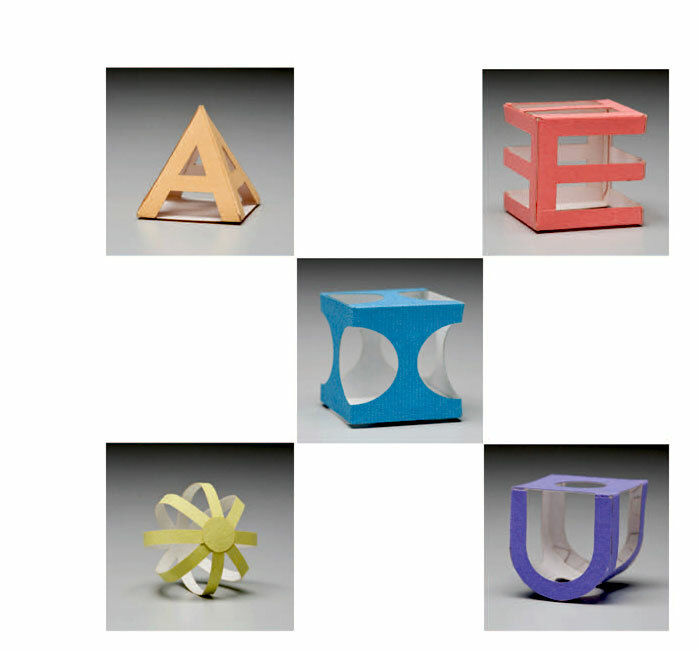 Helen Hiebert: "A set of five paper building blocks in the shapes of vowels, each one featuring a unique handmade paper. Housed in a cherry wood box, with a glass top that slides on and off. The blocks, which can be lined up, stacked or scattered, create a visual and tactile play on letters and language. While a word can be formed without any consonants – such as the English word I – no word may consist of only consonants, without a vowel. Vowels create the sounds in words, and sounds are the basic element of spoken language."